In an unprecedented move, popular writer Dmitry Glukhovsky and Russia’s biggest social network Vkontakte, join forces to publish his new novel. Russia’s biggest social network, VKontakte, which has been repeatedly accused of copyright piracy, has begun legal publication of a new novel by the famous Russian sci-fi writer Dmitry Glukhovsky (author of Metro 2033 and Metro 2034). Glukhovsky has no concerns about distributing his new novel free of charge; he owes his international fame to the Internet. The writer posted his Metro novel in chapters on his LiveJournal page and on the m-e-t-r-o.ru website, and only later was the novel published. 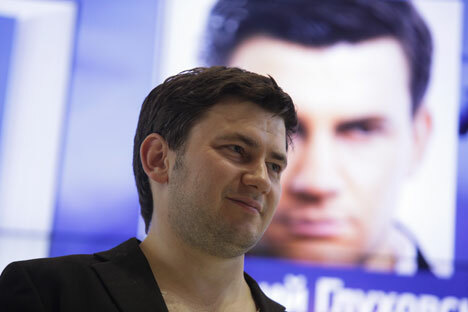 “I don’t think I support VKontakte; I think I exploit its potential,” says Glukhovsky. He says the social network is a handy publishing tool, because writers can post new chapters of their stories in any message. Glukhovsky admits that he is sharing his new novel for free. "My only profit is to test the new opportunities and reach more readers,” says the writer. The novel is titled “The Future,” which fits the new publishing concept perfectly. “The Future” is a multimedia and interactive project. Glukhovsky does not rule out the possibility of the novel’s text being modified in response to readers’ comments and reviews. “What people think about my work really matters; I depend on readers’ feedback,” Glukhovsky told reporters when asked why a modern writer needed this interactive publicity. “A new era is beginning and we have to move with the times,” the writer says. This will be the first time in Russia a copyright owner works with a social network. The Utopian novel “The Future” will be posted on VKontakte amid more aggressive efforts to curb copyright piracy on the Russian Internet. The Russian State Duma has recently approved a bill enabling Internet providers to block a website (based on its IP address) for posting illegal content. A spokesperson for VKontakte, Georgy Lobushkin stated that, given recent developments, it has been increasingly important for the social network to work with legal content. The free publication of the latest novel by a popular writer who initiated the move himself will be a step toward users, Lobushkin believes. Russian ACT will publish the book later this year, following its official online debut; sales will show whether the project will be profitable. “The death of the print book does not stand for the death of literature,” says Glukhovsky. Based on materials from Rossiyskaya Gazeta and digit.ru.